We are an enthusiastic and friendly class of 28 pupils 18 Year 1 pupils and 10 Reception pupils. In our class Miss Walker and Mrs Rolf enjoy learning with us everyday. We have many new, fun and exciting experiences that we look forward to sharing with you on this page. We aim to maintain a fun and engaging learning environment, where everyone feels confident, happy and valued. We often work with our learning partners and support each other in our learning and love to celebrate and share our successes in our collective reward times. After a busy morning or afternoon we love to have a good sing together or share our favourite stories. PE - Our PE days are on Tuesday and Wednesday. Please can you make sure your child has a suitable PE kit to use - both indoor and outdoor kit is recommended at this time of year. Year 1 Homework Books - To be returned every Wednesday. Monday 2nd July- Mini Garden entries need to be brought in to school to be judged during Eco-Council after school club. Please click on the link below to view the Year 1 homework. Remember you can access My Maths from home to practise and consolidate learning in the classroom. During World Maths Day we have started to access ttrockstars at school and will soon bring home logon details to practise your times tables at home. If you cannot remember your log in detail please ask your class teacher. What a fantastic day we all had. We saw so many different creatures and we learned so many facts about them all. They enjoyed using their senses to explore the woodland area as well as searching in a pond area and under logs and ditches. We were given various magnifying equipment to use so we could look very closely at what we found and study how they moved. This is the moment when two children spotted a frog under the table. We were all fascinated to see it and we were very quiet and still as we saw it breathing and hopping around. We used our knowledge of position and direction to help us with our fractions. We started making whole, half and quarter turns using our bodies as well as objects. This helped us continue using position and direction vocabulary. We have also been busy finding halves and quarters of shapes and objects. Some children have also been completing fraction number sentences. We have been learning the vocabulary which describes the position of objects such as next to and underneath. We now know our left, right, clockwise and anti-clockwise. We practised this through a few different activities outside and then we used maps, beebots and the beebot app on the iPad to practise giving directions. The children have been busy sharing objects into groups of 2, 5 and 10. they have also been learning about the division symbol and how to read and answer a division number sentence. They have used arrays and pictorial representations to help them calculate the answers. They have all been busy reading and understanding division word problems too. We have been busy learning about multiplication, grouping objects into 2's, 5's and 10's. We have been using numicon pegs and numicon to support our counting. We have also been counting using number squares and number lines. We have been very good at noticing the number patterns and talking about odd and even numbers. We have also used the counters to make arrays, focusing on addition and multiplication. We have also done an investigation on different ways of making the number 6 using addition, subtraction and multiplication. We have also been trying to develop our independence when using the resources, choosing what resource we think will support our learning. This week we have been learning about time and making our own clocks. We have then used them to play "What's the time Mr. Wolf" with our learning partners to consolidate our understanding of telling the time using o'clock and half past the hour. We have then moved onto understanding the relationship between addition and subtraction as well as finding missing numbers. We have been using resources such as number lines, Numicon and part-part whole diagrams to support our understanding. We have also looked at some addition problem solving activities involving next door numbers and finding all the totals when adding two dice together. We will continue to look at this next week. We have been busy learning about money. Identifying different coins and notes and understanding their value. We have been using money in a role play shop in class so that we can practise buying items with the correct money. The Year 1 children have also been looking at giving change and starting to read and solve problems relating to money. We have been busy measuring using non-standard measures such as our feet and hands as well as cubes and paper clips. We have been measuring different items in the classroom and comparing items that are taller or shorter. We were measuring the giants hand and comparing our hands to see who had the biggest hand. We have also been estimating how tall or long objects are. We then looked at measuring using standard measures such as centimetres and metres and what we use to measure with. We were careful to measure accurately using different rules and tape measures. What an amazing day we had doing maths challenges and being introduced to TTRockstars. We did 2 maths challenges and were able to access the ipads so that we could create our own avatar for TTRockstars. The first challenge involved making skeleton 3D shapes using art straws and playdough. We made the cube but then had to work out which 3d shape could be made from a specific number of straws and balls of playdough. We worked out that the art straws represented the edges and the playdough balls were the vertices. We could also see how a 2D shape can be made into a 3D shape. The second challenge involved a tower of 3 cubes of different colours. we had to work out how many different combination of tower could be made using only those 3 cubes. We found this easy and moved onto a 4 cube tower which was much trickier as there were many more combinations. We were concentrating a lot on these challenges and decided to have an occasional 3 minute brain break and dance to "We will rock you!" This helped us work even harder on our challenges and have lots of fun! This week we have been looking at weight and investigating balancing objects. We have used our hands and bodies to show heavy and light as well as explore different types of scales for measuing weight. We will continue to explore this further next week. Here are just few photos of what we have done so far. We have really enjoyed our first week of class maths which has involved learning all about capacity. We have explored a variety of different resources to measure how much different containers hold. We have also been practising our counting skills in order to compare which holds the most or the least. Some pupils found it tricky to estimate but they showed great resilience and found their estimates became more accurate as the week progressed. We were also busy estimating and measuring how many of each various container can hold a litre of water. There was lots of partner work and discussion all week as the pupils got used to their new learning partners. In maths this term we have been busy learning about Fractions, we have been finding halves and quarters of shapes and objects. We especially enjoyed finding halves of quarters of sandwiches too! We then moved on to 2D and 3D shapes and their properties, we enjoyed lots of partner work and discussion about shapes, including an investigation to find out which shapes roll. We then used what we knew about properties of shape to explain why only those shapes could roll. In our final week we explored position and direction and were introduced to the Beebots. The Beebots provided lots of opportunity to work independently in small groups practising directional language, taking turns, supporting and challenging each other our their learning. Here are some photos from our assembly and some we took during our practices. Miss Walker and Mrs Rolf were extremely proud of their performance today. Well done Murphy Class! In our class we celebrate our successes by giving each other fun verbal praises such a Woosh! or a Mashmallow Clap! We also earn reward that go into our class jar. We share ideas of what reward time we might like and then we do a class vote. Due to the bad weather we had to delay our reward time. We finally had the chance to get outside and enjoy football, skipping and there were a few books for children to sit and look at should they want a little rest on the bench. These are just a few photos to show you how much we enjoy our well earned reward time! Today Murphy Class filled our Reward Jar and the reward we chose was to have time on the big climbing frame outside. It was a double celebration as it was a pupil's birthday today too, they had kindly brought in some orange juice and buns for the whole class. So we decided to have a little picnic on the grass and sing Happy Birthday during our reward time. As you can see from the photos we had lots of fun and thoroughly enjoyed our little picnic! We read one of our new favourite class stories "Supertato!" We were surprised to find a letter addressed to Murphy Class from Supertato himself. "The evil peas had stolen the fruit and vegtables. I have managed to rescue them but they are all jumbled up. Can you sort them according to weight. I need 1 group that is lighter than 500g and one group that is heavier. Can you help me?" We worked together in small groups to help Supertato complete his mission. We made predictions having held a 500g weight to guide us, we then weighed each item to see how well we estimated. we worked well as team sharing ideas and taking turns to weigh using the balance scales. We were surprised that the mango was bigger than the 500g weight but was lighter. We went on to explore other items that might be like this. We learned that size can guide us but that just because something looks big doesn't mean it is heavy. We were inspired by Supertato and talked about the super powers of all our superhero's. Do we have super powers? We decided that everyone has superpowers and wrote down what super powers we thought we had or have seen in Murphy Class. Some of us are brave, super fast at running and are very kind or helpful. Everyone got to realise their super power in Murphy Class! We then spent the rest of the afternoon decorating our potatoes as "Supertato's!" Our partner class, Dr Seuss class then shared some lovely stories and we enjoyed a tasty hot chocolate. There were lots of smiles and laughter, we loved snuggling down and sharing our favourite stories. Today we filled our Reward jar when we received 5 rewards from Mrs Wilkinson for our assembly this morning. We then did our assembly again this afternoon for KS2 children and Mrs Padfield. We earned another 5 rewards! We decided that we would go outside and have extra playtime on the grass and take the bubble blowers from assembly outside too. We loved being out in the lovely sunshine and had lots of fun rolling down the hill and showing each other our running and gymnastics skills. It was a special treat having whole field to ourselves! We had a fantastic week finding out about and visiting RSPB Old Moor. We learned how to paint using watercolours and painted a scenic picture of Old Moor. We also found out about mini beasts and habitats. the children loved sorting and categorising the mini beasts in different ways. There was lots of discussion and children challenging each other with what mini beast facts they knew. Children were also exploring different books to find out more. They have been fascinated by habitats and the children have been very creative using different objects to make different habitats. They explored different levels and have worked collaboratively making them. They can give great detailed explanations as how the creatures live in these habitats too. They have been busy using their imaginations and sharing their learning with their peers. This term we are continuing our topic about Growth and the Year 1 children enjoyed our literacy week of fairy tales we have decided to continue with both topics this half term. We have been busy designing and building our own castles. We could choose how and which materials we wanted to use to make our castles. Some chose to use the construction blocks and others chose to use recycled objects. We have been getting excited about the royal wedding and we have been looking at photos of Windsor Castle and talking about its features. We have also watched a clip from William and Kate's wedding so that we had an idea of what it might be like to be a Prince or Princess getting married in such a large historic building. We had a royal wedding themed afternoon with various wedding ceremonies, Union Jack flag making and cake and dress designing. Since making our own castle in the role-play area the children have been curious about castles. So we have been busy learning more about them and we have been labelling the features of the castle and finding out what life was like for people living in a castle. We have been amazed by what we have learned and we didn't realise how cold and dark they were and how many different people worked inside castles. We have also designed our own castles and we are in the process of making them using junk modelling materials. We have also written some Castle facts and the writing has shown we certainly have some castle experts in Murphy Class! As you can see from the photos we have been using our choose time to make castles using various resources such as construction, small world resources and play dough! The last 2 weeks have been really busy we have been practising for our class assembly as well as making all the props and the castle. We had a lovely afternoon with the ducklings and we miss hearing them quack and splash about. Here are some of our memories from our circle time watching how they moved and what they do. We observed how they used their beaks and wings as well as how they interacted with each other. We also realised that if we were quiet and sat still that they gradually moved closer to us to see what we were and to find out about us too! We have shared some of our homework from Easter about Ducks and learned lots more facts about them. The nursery children were kind enough to let us have a look at the chicks so that we can compare them to the ducklings. 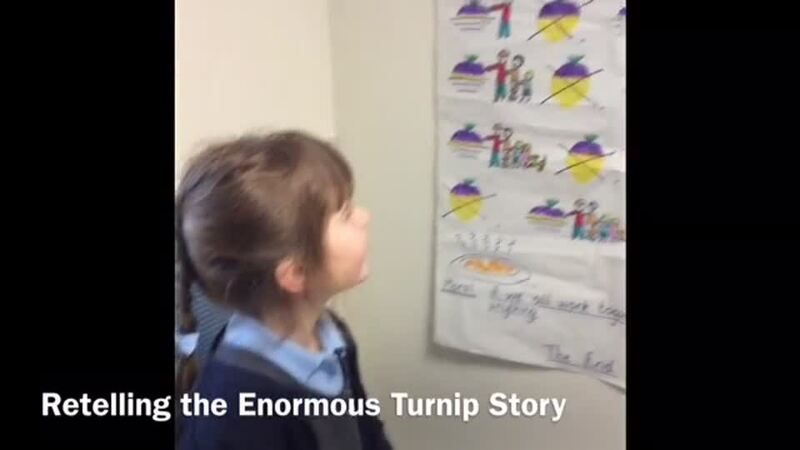 The Reception children have been retelling the story of the Enormous Turnip as part of our growing topic. This week we have been busy conducting a Broad Bean experiment. We know that seeds need soil to grow because that is how our grass grew. We are now investigating to see if a broad bean can grow without soil. We are making Bean Diaries to record out findings as we revisit our investigation over the next 2 weeks. We can't wait to see what happens! During science week we have also investigated bubbles and made out own bubble wands. We predicted what shape bubble would be created from each different shape bubble wand made. We were amazed by the fact that all the bubbles were the same. The size or shape of the bubble wand did not affect the bubbles. There were many different sized and shapes of wands and no matter how hard we tried to redesign their wand the bubbles remained the same. We had los of discussions about push and pull forces as well as how the air gets inside the bubble and how they can be different in size. As you can see from the photos we had lots of fun too! We have been busy watering our seeds to see what was growing. Some children were surprised to see that the seeds they planted have turned into grass. We have also sequenced and written about how to plant a seed. We started our new topic this week which was growth. We created a class mindmap about what we know about growth. We then had a look at some seeds and made some predictions about what would grow. We planted the seeds and we are waiting to see what will happen next. We also decided to change our role play area to a Garden Centre. We were busy making it look ready and we began a list of other items we might need such as signs, price tags and more aprons and gloves. The Year 1 pupils have brought in some brilliant models of houses built for different climates. They have had the chance to show and talk about what they learned over the holidays. What a lovely way to celebrate our learning in this topic. We have been finding out about is all about different things that are alive, dead or have never lived. So far we have used our geography skills to learn about places where plants and animals live, we have also started to learn about different environments where we can live. We really enjoyed learning about endangered animals and we did some lovely writing to show what we had found out. In art we used what we had learnt about different environments to create a colourwash and silhouette picture that represented either a desert, ocean, arctic or a jungle. We have also used our art skills to create still life pictures. We really enjoyed practising different shading techniques we had learned using pencils and the children were amazed at how many different shades they could make buy applying different pressures and angles with their pencil. After the half term holidays we will be finding out about living things through science.